General Information: The fruit grows in small clusters of 3-10 grapes, up to 1.5 inches in diameter. Each grape can have up to 5 hard seeds. Ranging in color from greenish bronze to almost black, they are grown for eating and the production of a sweet wine. The first record of a Muscadine vine dates back to 1534 in the Southeast U.S. Because the outer skin can be dense, some prefer to peel off the skin before eating. Just like other native grapes, this fruit is great for jam, juice, wines, or any other recipes calling for grapes. Muscadines are technically in the berry family and provide the beneficial phytonutrients associated with the purple to red range of fruits. Nutritionally speaking, muscadine grapes are low in fat and sodium, and have a healthy amount of potassium, fiber and Vitamin C. With a high antioxidant content, Muscadine are a natural superfruit. 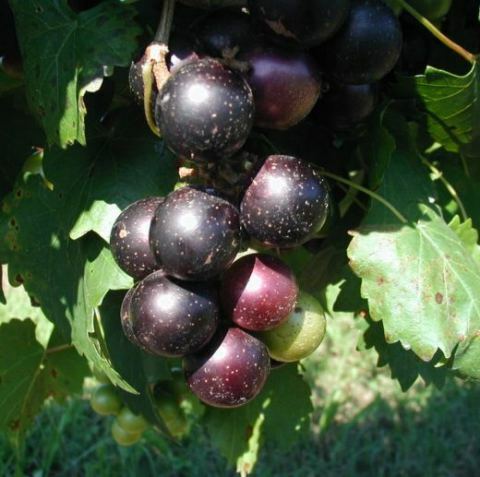 Choose Muscadine fruits that are uniform in shape and color and free of soft spots or blemishes. Store in a shallow container, unwashed, in the refrigerator for up to 1 week.